Karina's Kreations: Frosting Technique Card! I just had to try the frosting technique I learned. You need Tombo Multi Purpose Adhesive, 1 tsp of White Stampin Emboss Powder, 1 tsp Dazzling Diamonds Stampin' Glitter and 1 tsp Chunky Glitter. I used Crystal Iris. Mix the emboss powder and glitter in a small container. Stamp you image. Color it in. Cover the area that will be frosting with a layer of Tombo Multi Purpose Adhesive. Sprinkle on the glitter mixture and heat with a Heat Tool until it starts to bubble. Set it aside and let it dry. You will love the results! I used Whisper White, Real Red, Chocolate Chip and Pretty in Pink card stock with this card. 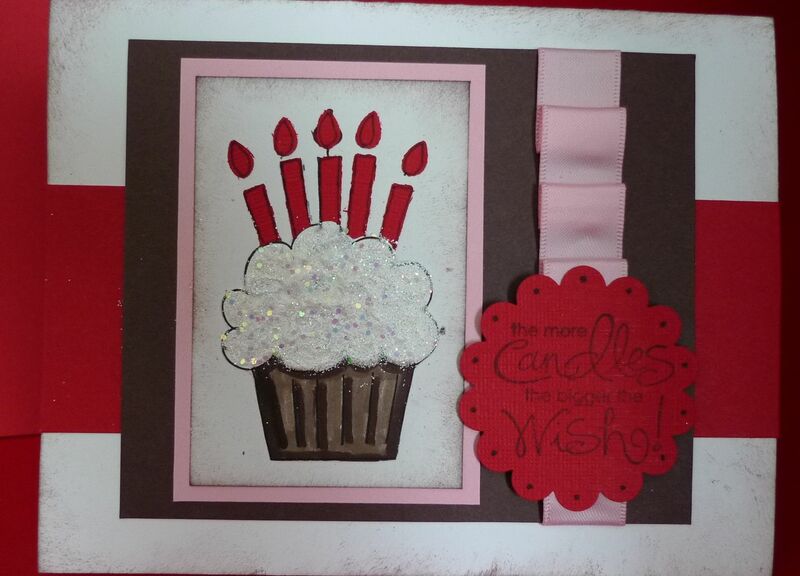 The candles were made with the Big Shot die cut machine and the Stampin' Up Big Bold Cupcakes Sizzex die. The gathered ribbon was made with Sticky strip and Pretty in Pink Satin Ribbon. I hope you will try this technique. We are trying it at my card classes next week.